Back in July, I shared with you the Fall 2010 and Winter 2011 color and fashion predictions from Pantone, FashionTrendsetter, and others. One thing that has occurred to me about fashion is that once a season and a trend has fully matured, it's pretty much too late for most of us to jump into it unless it's something that we can do production style. And really, most of us don't really like working that way. There are exceptions among you, but I find that most of my readers, at least those of you who speak up, would prefer to be making one of a kinds rather than producing items in the same style. That said, if we're going to benefit from following trends and fashion at all, we're either going to need to look ahead to what's coming in future seasons, or we're going to need to just follow the trends in a more general way. Long earrings or short? Multi-strand necklaces or single? Bright blue or muted? 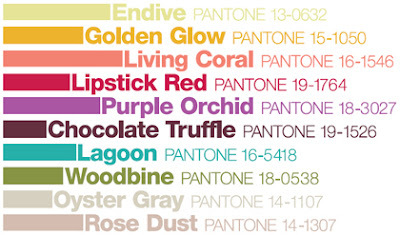 Resources: search Pantone for seasonal color articles and Fashion Trendsetter for styles.